Rippling along rough surfaces and the beautiful meadows, the numerous rivers that dot Indian mainland are central to our history as well as to Indian mythology. 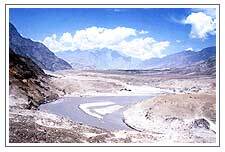 The main rivers of the Himalayas group are the Indus, the legendary Ganga and the Brahmaputra. These rivers are both snow-fed and rain-fed and therefore perennially flow throughout the year. 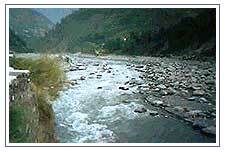 Himalayan rivers discharge about 70% of their inflow into the sea. This includes about 5% from central Indian rivers. They join the Ganga and drain into the Bay of Bengal. 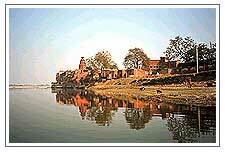 The holiest of all the rivers, Ganga or the Ganges is a perennial river, which is held in high regard by the Hindus. The Ganga river has an exalted position in the Hindu ethos. The Gangotri Glacier, a vast expanse of ice five miles by fifteen, at the foothills of the Himalayas (14,000 ft) in north Uttar Pradesh is the source of Bhagirathi, which joins with Alaknanda, to form Ganga at the craggy, canyon-carved town of Devprayag. Yamuna, also called as "Jamuna", originates from the Bundar Poonch glaciers in district Uttarkashi of the state of Uttaranchal. It rises from Jamunotri, in the Himalayas. River Tons, which flows along the boundary of Himachal Pradesh, west of district Tehri Garhwal joins Yamuna River at Kalsi and thereafter joins the plains. From Kalsi, the river flows along the boundary of Himachal Pradesh. Yamuna flows in a southerly direction through the Himalayan foothills and onto the northern Indian plain, along the Uttar Pradesh-Haryana State border. The Eastern and Western Yamuna canals are fed from the river at that point. One of the great rivers of Asia, the Brahmaputra commences its 3,000-km journey to the Bay of Bengal from the slopes of Kailash in western Tibet. As Tibet's great river, the Tsangpo, transverses east across the high-altitude Tibetan plateau north of the Great Himalayan Range, carving out myriad channels and sandbanks on its way. As it tumbles from the Himalayan heights towards the plains of the subcontinent it twists back on itself, cutting a deep and still unnavigated gorge, until finally turning south it emerges in Arunachal Pradesh as the Dihong. Just beyond Pasighat, it meets the Dibang and Lohit where it finally becomes the Brahmaputra.